Almost three months to the day since the storm surge that wracked the East coast and Havergate specifically the repairs to the seawall are complete. The two major breaches and umpteen slippages were repaired in an operation lasting a little more than a month. At times the weather was simply awful but despite all this what we wanted to achieve, by and large, we did. One of the striking things about the repair work done to the island was the change in policy towards the seawall. Rather than build it bigger and higher, the RSPB took the decision to lower, widen and reinforce the wall. 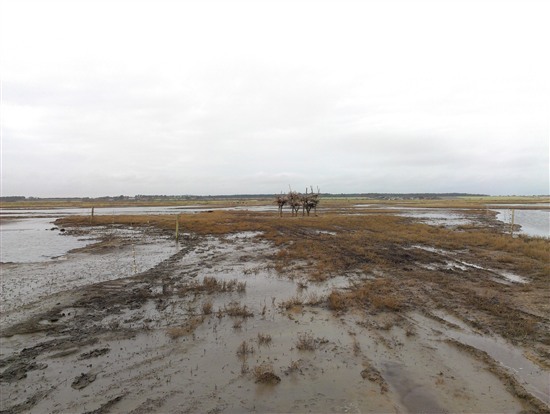 Havergate is always going to flood and this decision was taken to lessen the impact of any further events on Dovey's lagoon. The idea is to control the overtopping by allowing the reinforced section to overtop first, this then fills the lagoons up and stops any major scouring occurring at higher thinner parts of the seawall. However, as much as this is now complete, repairs work are still ongoing. Anyone who has visited Havergate before will be struck by the changes just one big tide can make. There is no Reception and visitor centre anymore, the remains having being demolished by the digger. 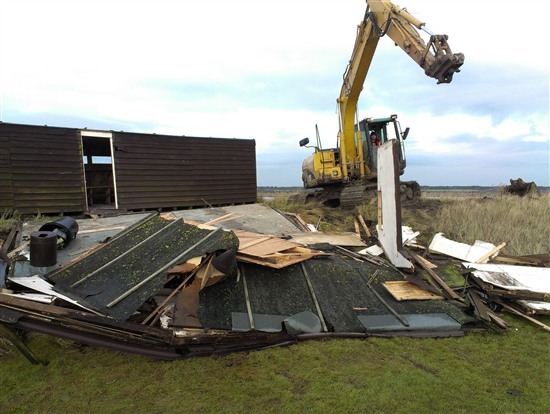 Gullery hide has been taken down in a more controlled fashion and the toilet block, though now down from the tree is still not fit for use by the general public. So, what happens next? Well the immediate crisis has passed the walls have been repaired, the integrity of the saline lagoon habitat has been maintained and the island is ready for the years breeding season. We also found the time to construct a new set of breeding platforms for the spoonbills and erect an electric fence around them. In terms of the infrastructure; Reception centre will never be replaced, the sun has set on the remains of the oldest hide on the island. However, we have exciting plans to move the deconstructed Belpers hide down to roughly the same location as the reception centre was to give great views across Main. This however, will mean some disruption for at least the next year or so as it rebuilt in the new location but as the volunteer guide said to me on the recent Saturday visitor trip "it's not as comfortable as it was but the birds are just as excellent". So, we are officially reopened albeit in a much reduced capacity having cancelled our major events for spring and several private trips but for details of how to book see our website. I should add that we are fully booked until July and a word of warning about the Hare population on the island. They are still around and you will definitely see them, however, do not expect to get as close as you have in previous years. Not only due to the reduction in numbers but those that are left are much more skittish. On an unrelated note, sadly this will be my final blog as Havergate warden. After four thoroughly enjoyable years I have decided to move on to seek a new challenge with the Essex Wildlife trust. Since I won't get the chance to thank everyone personally, can I just take the chance to say a BIG thank you to all that have either helped or supported Havergate in my time as warden. I'm sure I will bump into some of you again, either on Havergate or elsewhere on the Suffolk coast.